The bottom line is that statistically there never was a recent ‘pause’ or ‘hiatus’ in warming. If you ever thought there was you’d have plenty of company, but 2014 sees temperatures returning to the trend line. There simply has been no statistically significant slowdown, let alone a “pause”. He then displays an analysis done for Realclimate by Niamh Cahill of the School of Mathematical Sciences, University College Dublin using a technique called change point analysis. This time GISTEMP data from NASA GISS is used from 1880 to the present. 2014 was represented by January to October data, the latest available. Change points were found approximately at 1912, 1940 and 1970. The trend since 1970 is firmly in place. Tamino at Open Mind took a look at the same data. People often cherry pick a starting date so using a different statistical technique he examined whether there had been any change in trend starting from any year between 1990 and 2008. 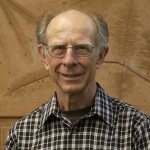 Often people choose a data set that suits their argument so he ran the technique over all eight commonly available data sets. He could find no trend change – not even close. It’s all happening between the trend lines. Of course there are fluctuations, but none of significance. Not yet. For a time the Hadley data simply left out the Arctic area where there are no weather stations. Of course the Arctic is warming faster than lower latitudes and it came to a point where this mattered. Recently they’ve corrected this by using satellite data, not directly, as the satellites measure the troposphere rather than the surface. I gather the satellite data is used comparatively to infer the surface temperature across the Arctic. 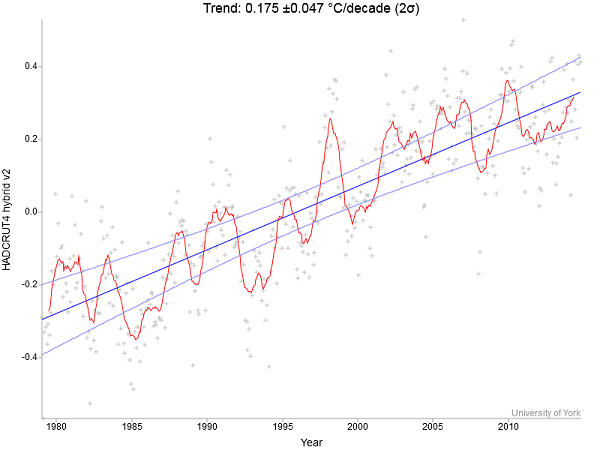 Notice how the heavier corrected lines make 1998 a little cooler and recent peaks a little warmer. Even so, I recall that Ross Garnaut in preparing his report about five years ago asked two leading statisticians to examine the trends. They said the long term warming trend was still in place. Seems they were right. Andrew Bolt, the world’s greatest climate scientist, and his assistant, George Pell, will soon have a devastating takedown of this amateurish attempt to disprove the obvious fact that the planet is cooling. Thanks for pulling this together. The only pleasure to be derived from all of this is in how the denialists are coping with the empirical evidenced demolition of their “impending ice age” narative. The Nova website, which is most easily accessed by googling “Jon” (conveniently consistent with what one will find there), has taken to denigrate every one and everything. This from someone who calls hereself a “science communicator”. Particularly amusing is the total brain fade of, Dr David Evans’, her husband’s, “””””climate notch filter solar driven pending ice age theory””””, which was demolished by pretty well everyone, including many of her minions, and failed to bring in the millions imagined through access to the “proof”. Even the Lord denialist Monckton gave it an “I’m not a scientist but it sounds good” reception, which is an arms length connection from the likes of him. Catallaxy has resorted to supporting David Leyonhjelm in pretty well anything he espouses in the Senate, and denigrating the Climate Change Authority and Keynes. No surprises there. I think that Sinclair Davidson is really just pleased with himself that he can spell Leyonhjelm’s name repeatably with ease.